I am sitting here in my warm, cozy living room with my coffee. it is the first day of the New Year, 2012. What used to be the distant future that we thought surely could never come. But here we are. Blessed. Joyful. Healthy. Thankful. We have just spent a week and a few days with family whom we only see a few times a year. My brother, and my sister and her family. The almost 900 miles between here and where they live makes it that much sweeter when we are together. It’s a long trip. 15+ hours with kids. They hadn’t been here since last Christmas and we were only out there for 6 days this past July. ‘The Teenager’ and Miss R. went back and forth between Grandma’s and here. Tons of fun was had by all! My ‘little’ brother is a highlight for all my girls. They love Uncle J.! We were sad when he moved 900 miles away to the same area my sister moved to when she got married. But we are happy for him because he loves it there. And we are thankful it IS the same place our other family is so we only have to travel one place to see them all! We get pretty used to having him around again really quick and it was sad to see him go again. But hopefully we will travel west this year and see them all again. 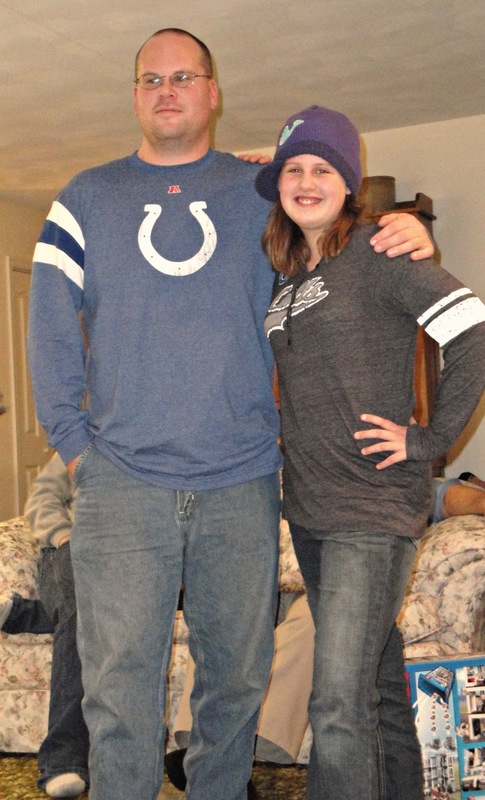 As you can most likely tell from the photo above this family is a Colts fan family! That would be thanks to Uncle J.! !